The following is a list of game play guidelines and suggestions we feel helps you get the most out of your creative fiction and gaming experience. Please follow them as often as possible. Play nice, play dirty – but make sure you play. When you commit to a collaborative game, you’ve made an unspoken promise to other players and Storytellers about your participation. That off-hand remark by a random person on the street, a recurring nightmare, that random object you happened to stray upon… Very few things in an RPG are meaningless. All players are welcome to join any scene already in play. There is no such thing as ‘closed’ or private scenes, and interaction is the name of the game. To get involved, simply have your character enter the scene – and we recommend the worst possible moment to do so! Part of your job as a player is to find ways to have your character form relationships with others. Don’t isolate your character; don’t be shy or shuffle your feet . Get your character out there and meeting others. The purpose of our game is to write a never-ending story by collaborating with other players. There is no end or winner. There is an ongoing story and a world that’s continually being developed. The game has a setting, environment, and history that has been developed by both Storytellers and players. Click here to read more about our current game, Mysteria Island. How to Create Believable Characters is your critical guide to learn the near-magic trick that breathes life into your character, the crucial tips to create believable personality and the pro writer advice on how to craft characters readers fall in love with. 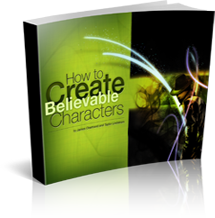 Click here to get your copy of How to Create Believable Characters today.